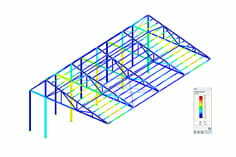 How does RF steel EC3 deal with class 4 sections? Is the statement "class 4" taken into account the existing stress? RF- / STEEL EC3 measures cross-sections of cross-section class 4 using the effective width method according to EN 1993-1-5. The existing voltage is taken into account.